WLI stood at 120.9, upfrom the prior week's revised reading of 120.7. The lowest reading for WLI this year was 120.4 for the week ending July 16. 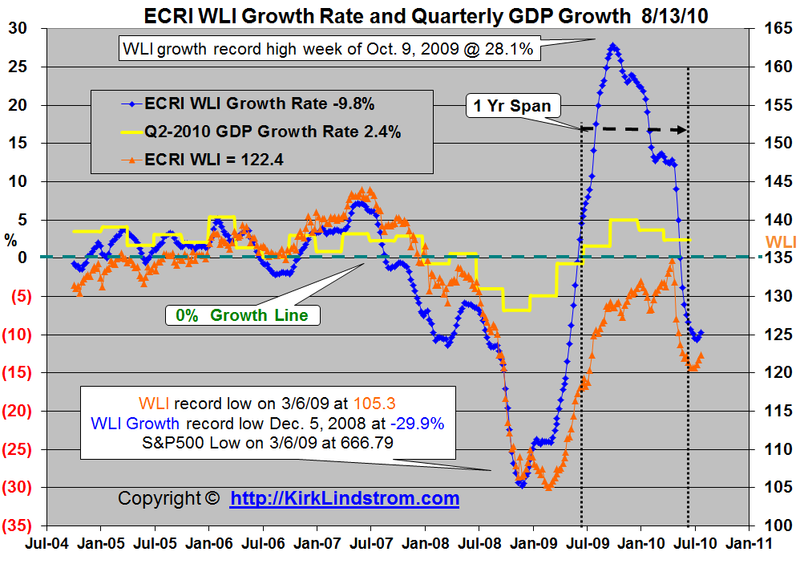 WLI growth moved higher for the fourth week in a row to minus 9.9 percent from a revised minus 10.1 percent a week ago. Today's chart shows the second estimate for Q2 GDP growth which came in today at a positive 1.6%, revised down from 2.4% as shown on last week's chart. The WLI for the week ending 8/27/10 will be released on 9/3/10. 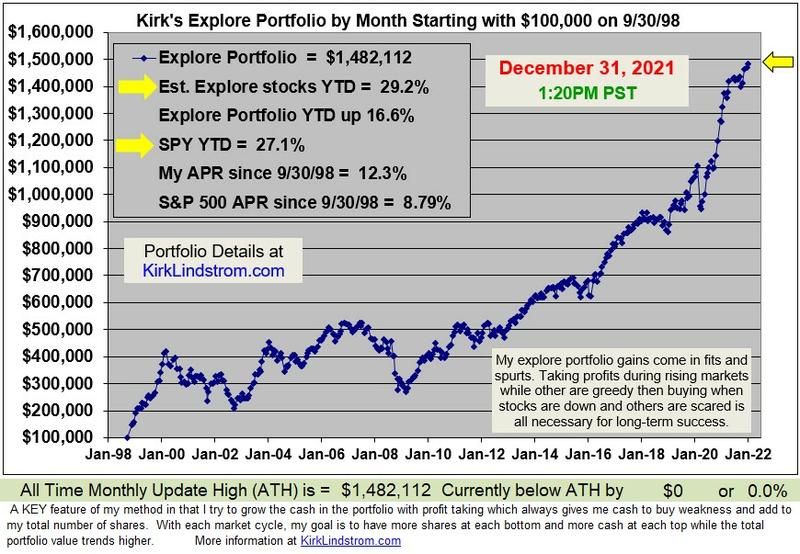 Disclosure: I am long SPY (charts and quote) in my personal account and in the "Explore Portfolio" in "Kirk Lindstrom's Investment Letter." 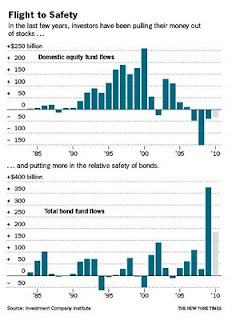 Money continues to pour into bond funds and out of equities. This is the fifth week in a row with positive (inflows) into low yielding money market funds. Annual data shown in table 1 below. 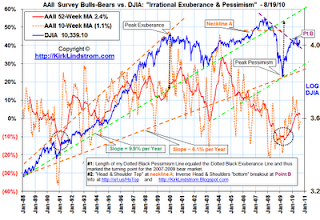 One of the oldest weekly sentiment indicators is the “Investors Intelligence Survey“ or IIS. 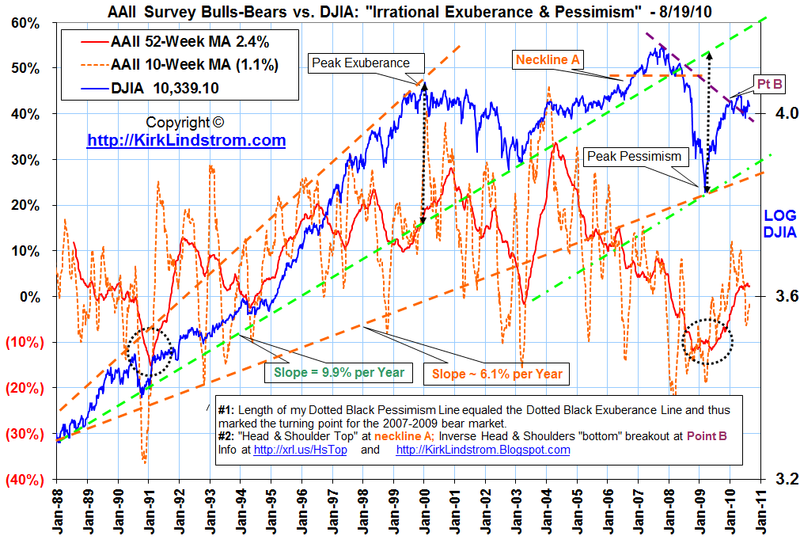 A chart of the Investors’ Intelligence Survey (IIS) “Bulls over Bulls plus Bears” versus the market is a key sentiment tool for stock market technical analysis. 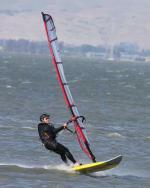 The IIS began in January 1963 by A.W. Cohen and has been published every week ever since. Cohen was surprised to find out that the newsletter writers, just like average investors and speculators, were usually wrong at major turning points! Cohen found the best time to go long the stock markets was not when the most advisers were bullish, but when they were bearish! Cohen’s IIS survey turned out to be a wonderful contrarian indicator! Subscribe NOW and get the Current Month's Issue for FREE! ! Charles Neener, former Goldman Sachs technical analyst, is on CNBC talking about his market advice. 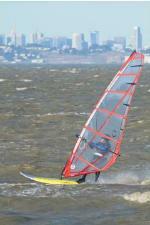 Subscribe NOW and get the August 2010 Issue for FREE! ! #1 Kass is bullish now. Kass expects the market (S&P500 Quote and Charts) to trade between 1020 and 1150 (roughly between 11x and 13x 2011 S&P EPS forecasts). At 1075 "there is approximately 55 S&P points of risk and about 75 S&P points of upside. In other words, the scale has now tipped back to the bullish side." Last year Kass called for a "generational low" in March 2009. 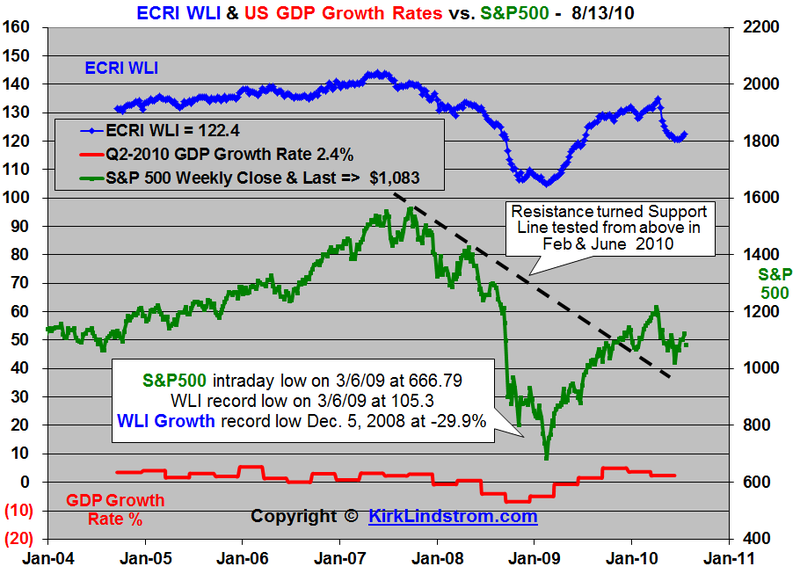 With the market now in the 1050s, there is even more upside and less downside left. #2 Kass says "Stocks Are Extraordinarily Cheap Against Interest Rates. * For the first time since 1962, the yield on the Dow Jones Industrial Average exceeds that of bond yields. * Risk premiums (the difference between the earnings yield of the S&P index and the 10-year U.S. note) is at the highest level since the beginning of the modern era's bull market that began in the early 1980s. * Nearly four-fifths of the companies contained in the S&P 500 index possess earnings yields that are greater than bond yields. And many have (growing) dividend yields that are similar to their own bond yields. *The BTIG Fed Model says equities are nearly as compelling (last week) as they were in March 2009 when Kass said the market was making a "generation low." The "BTIG Fed Model" attempts to place a more conservative and defensive twist on the traditional Fed Model. When the levels of risk and fear rise in the financial market, Treasury Bonds represent the safe haven for investors and Equities are a proxy for risk. Thus, Treasuries become expensive relative to Equities, but that heightened level of risk is the obvious reason for that shift. In order to account for the fear risk, in the BTIG Fed Model, we use the Vix in conjunction with the 10 Year Treasury Yield to raise the threshold with which Equities must compete. During these episodes of heightened fear, the Vix traditionally moved inversely with the 10 year Treasury yield. The Vix rises with the volatility and Treasury yields contract due to a flight to quality. Thus by taking the Vix and dividing by 10 and adding it to the 10 Treasury yield, we derive a larger number representing bonds not only reflecting the expected cash flow, but also adjusting for the heighted level of risk investors perceive in equities. Then comparing this "higher bar" to the S&P 500 earnings yield, one is comparing this relationship on a more conservative basis for equity investors. Additionally, we are using trailing S&P 500 earnings yield, which is also more conservative than using forward estimates. What is extremely noteworthy about this metric in the current environment is that the level of equity undervaluation relative to Treasuries today using this model is equivalent to the extreme levels registered in early March of last year. I cover the simple "Fed Model" in "Kirk Lindstrom's Investment Letter" but I sure like the added value of the BTIG Fed Model. Kass's belief that the market is a good trade here aligns well with much of my own thinking and work. So much so that I was a buyer of equities earlier this morning for my personal portfolio and my newsletter "explore portfolio." I alerted my subscribers via email what I bought. Investors withdrew a staggering $33.12 billion from domestic stock market mutual funds in the first seven months of this year... Now many are choosing investments they deem safer, like bonds. Bonds won't be "safe" if interest rates surge. Bonds have been in a bull market as interest rates have fallen from the mid teens in the 1980s to record low levels today. Stories on TV about this say the hardship withdrawls are often used to pay mortgages to prevent or delay foreclosures. As a contrarian, I have been adding to my equity positions during this recent market pullback. 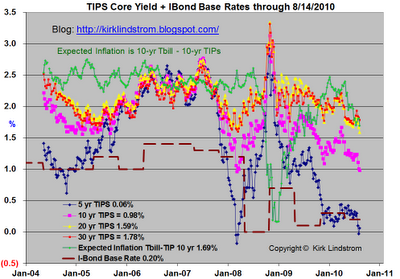 Also, I am completely out of bonds not indexed to inflation and am considering lowering exposure to those as well. I may add more to equities given it is so much against the crowd to own stocks these days. In addition to equities, I am currently long TIPS, TIPS funds VIPSX (charts and quote) and FINPX (chart and quote) and Series-I Bonds (the majority have a 3.0% base rate) in my personal account. I-Bonds will not lose net asset value if rates surge but new i-bonds currently pay very little above inflation so I have most of my cash in CDs and savings accounts paying over 1.0%. I personally own no bonds or bond funds not indexed to inflation. I also own a REIT fund. REITs pay good income and should do well in a growing economy but they could suffer if we have a double dip recession. 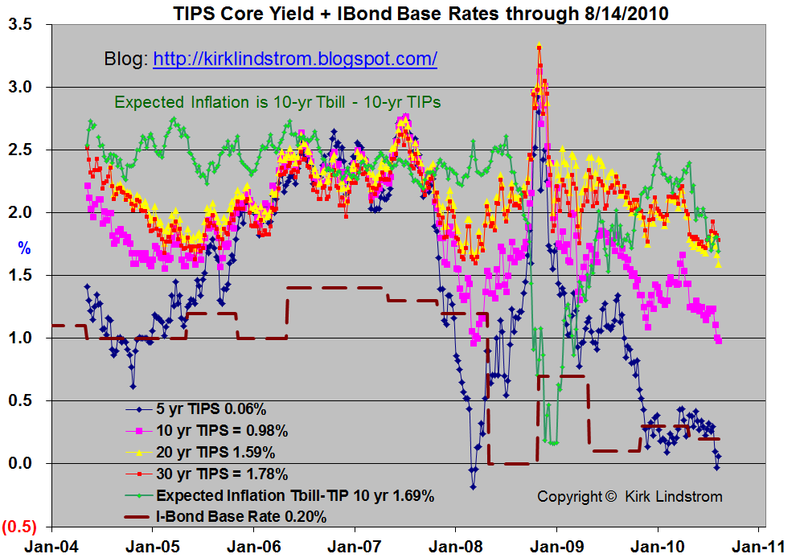 In both the "core" and "explore" portfolio in "Kirk Lindstrom's Investment Letter" I sold all bonds not indexed to inflation with the majority of my fixed income (about 30% of the total) in cash and CDs. 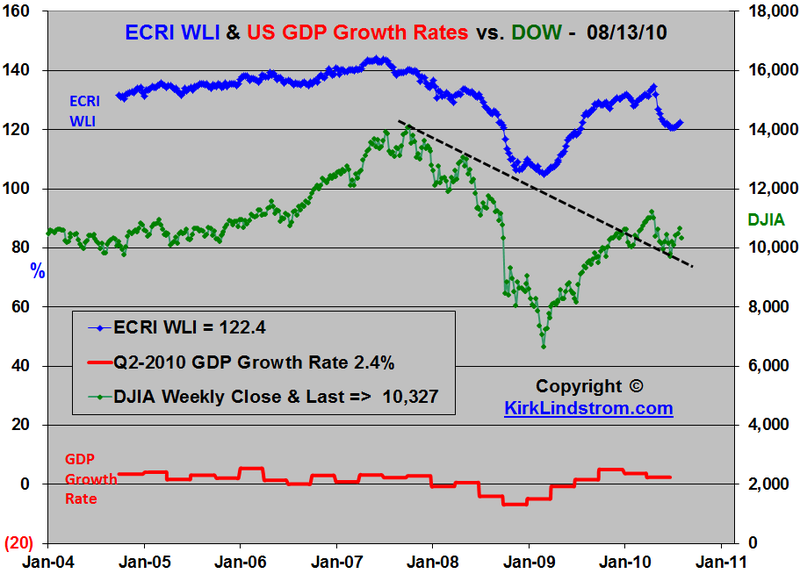 For yield and diversification, I have a REIT fund in the "Core Portfolio" in "Kirk Lindstrom's Investment Letter" that has done well the past two years and should continue to do well if the economy avoids a double dip recession. For the Future: I am strongly considering selling my TIPS funds to lock in nice gains and perhaps wait for them to pay a better spread similar to when I bought them. The individual TIPS I bought pay inflation plus better than 1.0% so I can hold those to maturity and do very well with or without inflation. 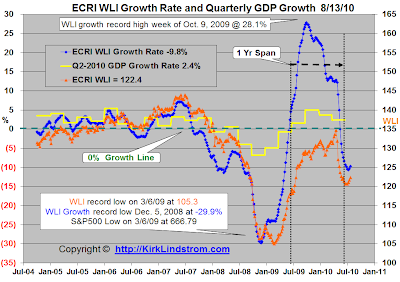 WLI stood at 120.8, down from the prior week's revised (lower) reading of 122.0. The lowest reading for WLI this year was 120.4 for the week ending July 16. 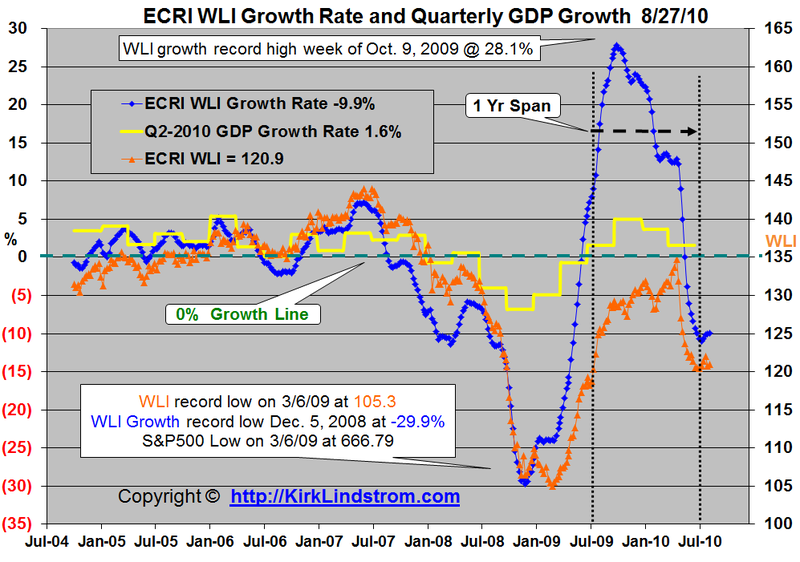 WLI growth moved higher for the third week in a row to minus 10.0 percent from minus 10.2 percent a week ago. 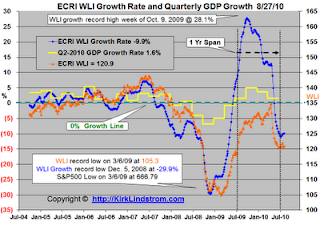 "With the WLI staying essentially flat for the last six weeks, following a nine-week plunge, it is premature to predict a new recession, though risks remain." The WLI for the week ending 8/20/10 will be released on 8/27/10. The AAII Investor Sentiment Survey measures the percentage of individual investors who are bullish, bearish, and neutral on the stock market for the next six months . AAII is the "American Association of Individual Investors." For the survey, Individual members of the AAII are polled on a weekly basis. Only one vote per member is accepted in each weekly voting period. The AAII reports the weekly results at http://www.aaii.com/sentimentsurvey/. The 10-week MA seems to indicate the correction bottom is in and the market rally should continue for awhile. Jeremy Siegel (author of Stocks for the Long Run ") was just on CNBC to say bonds are in a bubble and stocks are a better deal. In an op-ed written at the "Wall Street Journal," Jeremy Siegel and Jeremy Schwartz say that bonds, and in particular Treasury bonds are extremely overpriced, similar to what the tech bubble experienced in the late 1990's. The rush into bonds has been so strong that last week the yield on 10-year Treasury Inflation-Protected Securities (TIPS - More Info) fell below 1%, where it remains today. This means that this bond, like its tech counterparts a decade ago, is currently selling at more than 100 times its projected payout. Shorter-term Treasury bonds are yielding even less. The interest rate on standard noninflation-adjusted Treasury bonds due in four years has fallen to 1%, or 100 times its payout. Inflation-adjusted bonds for the next four years have a negative real yield. This means that the purchasing power of this investment will fall, even if all coupons paid on the bond are reinvested. To boot, investors must pay taxes at the highest marginal tax rate every year on the inflationary increase in the principal on inflation-protected bonds—even though that increase is not received as cash and will not be paid until the bond reaches maturity. From our perspective, the safest bet for investors looking for income and inflation protection may not be bonds. Rather, stocks, particularly stocks paying high dividends, may offer investors a more attractive income and inflation protection than bonds over the coming decade. Due to economic growth the dividends from stocks, in contrast with coupons from bonds, historically have increased more than the rate of inflation. The average dividend income from a portfolio of S&P 500 Index stocks grew at a rate of 5% per year since the index's inception in 1957, fully one percentage point ahead of inflation over the period. That growth rate includes the disastrous dividend reductions that occurred in 2009, the worst year for dividend cuts by far since the Great Depression. If 10-year interest rates, which are now 2.8%, rise to 4% as they did last spring, bondholders will suffer a capital loss more than three times the current yield. What I own: In addition to equities, I am currently long TIPS, TIPS funds VIPSX (charts and quote) and FINPX (chart and quote) and Series-I Bonds (the majority have a 3.0% base rate) in my personal account. I-Bonds will not lose net asset value if rates surge but new i-bonds currently pay very little above inflation so I have most of my cash in CDs and savings accounts paying over 1.0%. I personally own no bonds or bond funds not indexed to inflation. I also own a REIT fund. 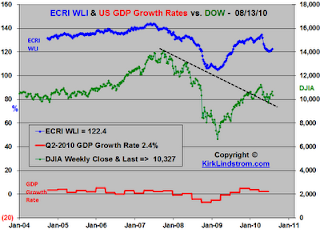 REITs pay good income and should do well in a growing economy but they could suffer if we have a double dip recession. You can read the full Siegel/Schwartz article by putting "The Great American Bond Bubble" in a search engine. WLI stood at 122.4, up from the prior week's revised (lower) reading of 121.7. The lowest readings for WLI this year was 120.6 for the week ending July 2 and 16. 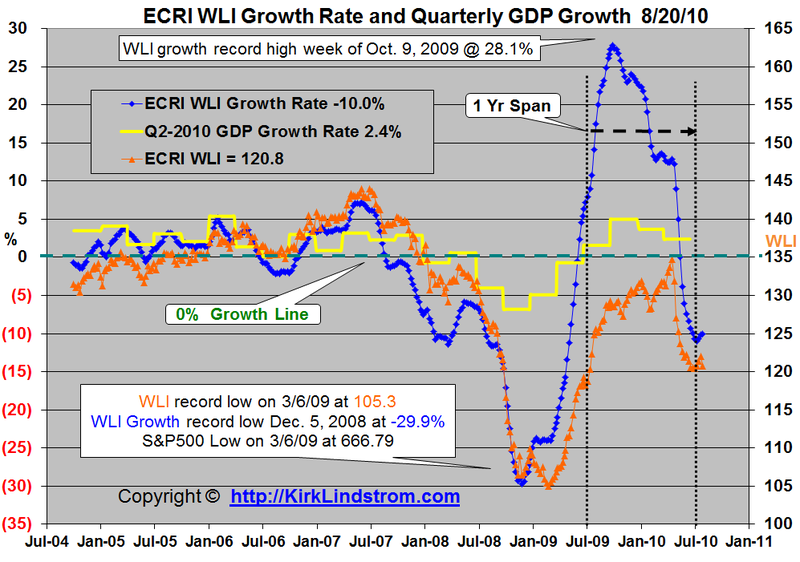 WLI growth moved higher for the second week in a row to minus 9.8 percent from minus 10.3 percent a week ago. Commenting on the numbers, ECRI's managing director Lakshman Achuthan said, "The WLI plummeted for two months through late June before flattening out and then rising to a nine-week high. 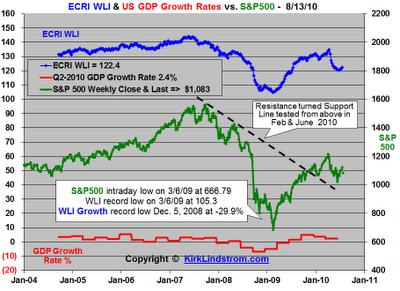 But if it turns down once again, that would signal heightened recession danger." 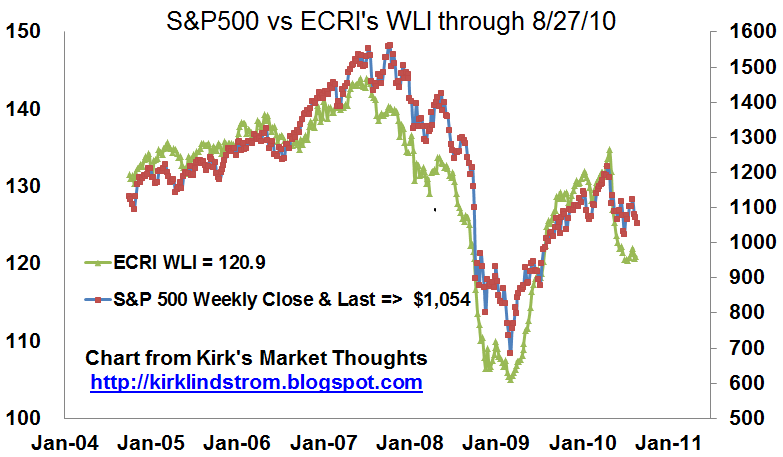 The WLI for the week ending 8/13/10 will be released on 8/20/10.